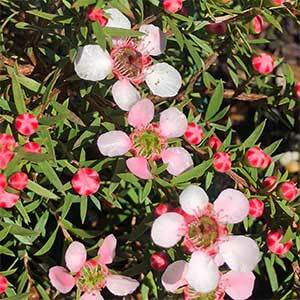 Leptospermum ‘Pink Cascade’, takes full sun, will grow beneath eucalypts, and flowers prolifically in spring to summer. This is a hybrid between Leptospermum polygalifolium and Leptospermum continentale and it is low growing and spreading. The flowers start of bright pink and fade to white. They are bird attracting as they are filled with nectar in the flowers. The plant itself has a natural arching habit, so it does look quite graceful, and it can be used in a position where it can cascade over a low garden wall or embankment. In a well drained soil and full sun to a little shade this is an easy care plant. Water during very dry periods over spring to summer. You can selectively, lightly prune individual stems to maintain size and shape. Common Name – ‘Pink Cascade’ Tea Tree. Soil – Well drained. Tolerant of poor soils. Height – To around .6 – .8 metres. Flowers – Pink fading to white. Foliage – Mid to deep green and lance shaped.